Want a twist on banana bread that’s paleo, grain-free, gluten free and sugar free? It’s packed full of good fats and fibre and yummy toasted and spread with butter. It is very dense and rich. Cut, wrap and freeze for adult lunch boxes (or places you can take nuts!). Set oven to 170C and prepare a large loaf tin (or 2 smaller ones). Whisk eggs in a mixer until thick. Add mashed banana and avocado and other ‘wet’ ingredients. Mix well. Add dry ingredients, mix well. Pour batter into loaf tin/s. Bake in the oven for about 45 mins. If using a large tin, towards the end you may need to cover with foil so it doesn’t over-brown and cook for an additional 15 mins so that the middle cooks through. I think next time I’ll try it in 2 smaller tins. Cool in tin for at least 10 mins before turning onto cooling rack. Serve immediately or toast once cooled and spread with butter. For the extra sweet tooth you could add honey on top too. 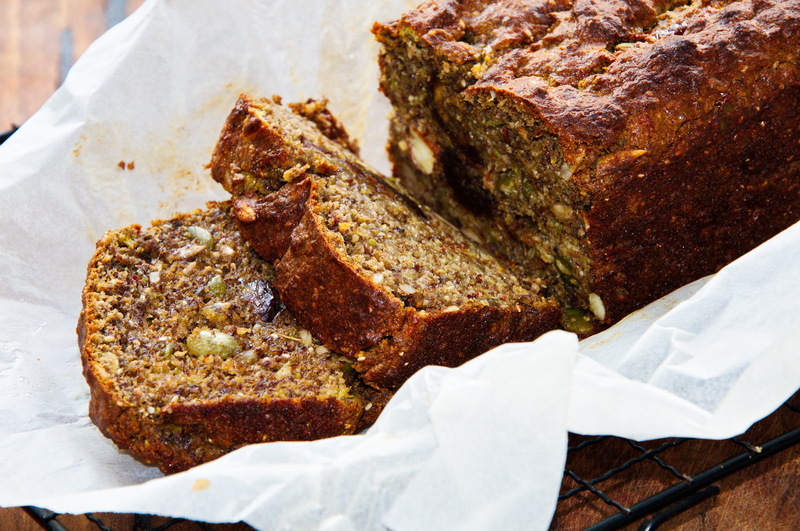 This is a twist on Irena Macri’s banana bread in her book Eat Drink Paleo.